40 years ago on 12 April 1970, Apollo 13 set off to be the third crew to land on the Moon and explore the Fra Maruo highlands. Due to a faulty incompatible 25 cent part in the oxygen cryo tanks, the mission was not to be - almost marooning the astronauts - and with smarts and ingenuity - turned into NASA's greatest successful failure. The Apollo crew depended on instructions from Mission control, making it all up as they went along - from crafting square filters for round receptors to using the L.E.M as a lifeboat to limping back on a handful of volts. 40 years later, we celebrate the careers and smarts of the Apollo 13 mission, from the astronauts to the mission control crew and all others involved in bringing the explorers home. 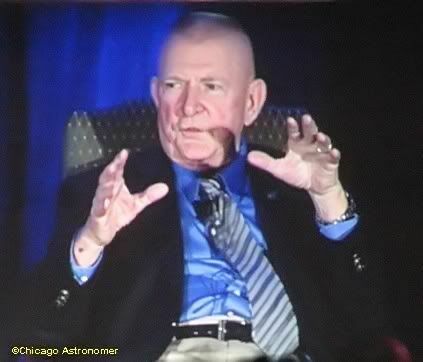 The Adler Planetarium has assembled two of the astronauts and three Houston ground control flight directors to discuss their experience with the public, held at the Hilton hotel in Chicago. Haise was one of 19 selected by NASA in its fifth class of astronauts in April 1966. 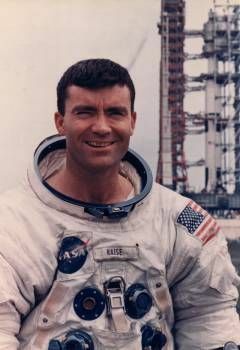 He was backup Lunar Module pilot for the Apollo 8 and Apollo 11 missions before being named to that slot on the Apollo 13 crew. 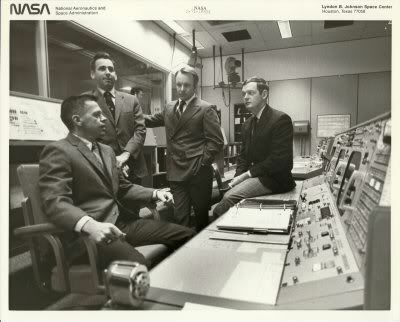 Between 1973 and 1976, Haise was technical assistant to the manager of the Space Shuttle Orbiter Project. He was commander of one of the two-man crews which piloted Space Shuttle approach and landing test flights in 1977. 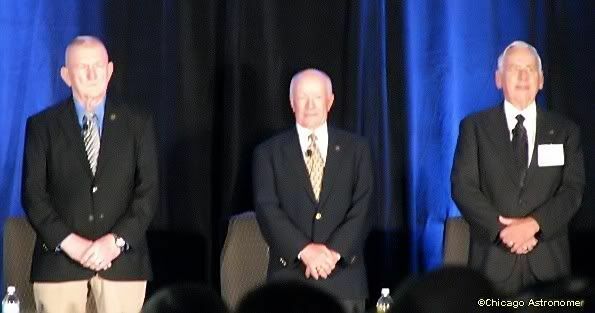 Haise retired from NASA in June 1979 and held several managerial positions with Grumman Aerospace Corporation before retiring in 1996 and was inducted into the U.S. Astronaut Hall of Fame on October 4, 1997. On December 4, 1965, he and Frank Borman were launched into space on the history-making Gemini 7 mission. The flight lasted 330 hours and 35 minutes and included the first rendezvous of two manned maneuverable spacecraft. The Gemini 12 mission, commanded by Lovell with Pilot Edwin Aldrin, began on November 11, 1966. This 4-day, 59-revolution flight brought the Gemini program to a successful close. Lovell served as Command Module Pilot and Navigator on the epic six-day journey of Apollo 8 - man's maiden voyage to the moon - December 21-27, 1968. Apollo 8 was the first manned spacecraft to be lifted into near-earth orbit by a 7-1/2 million pound thrust Saturn V launch vehicle; and Lovell and fellow crewmen, Frank Borman and William A. Anders, became the first humans to leave the Earth's gravitational influence and also the first American to fly in space four times. Captain Lovell held the record for time in space with a total of 715 hours and 5 minutes until surpassed by the Skylab flights. 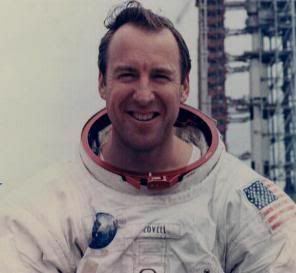 On March 1, 1973, Captain Lovell retired from the Navy and from the Space Program. 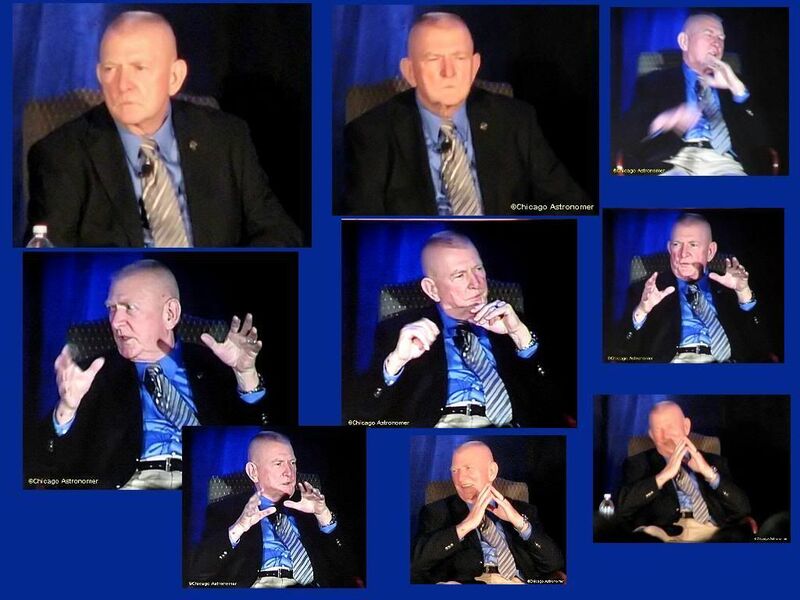 Eugene Francis "Gene" Kranz (born 17 August, 1933) is a retired NASA flight director and manager. After entering the Air Force and serving in South Korea, Kranz began work for McDonnell Aircraft testing missile launches off of B-52s at Holloman Air Force Base. Kranz served as a flight director during the Gemini and Apollo programs, and is best known for his role in saving the crew of Apollo 13. 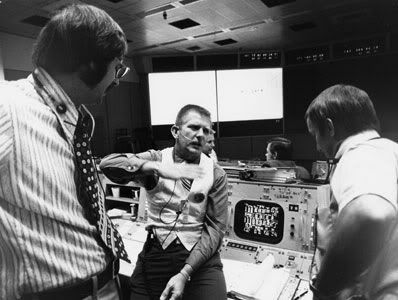 He is also famous for his trademark flattop hairstyle, and the wearing of vests (waistcoats) of different styles and materials during missions for which he acted as flight director. Kranz has received the Presidential Medal of Freedom. Mr. Griffin is the former Director of the NASA Lyndon B. Johnson Space Center in Houston. 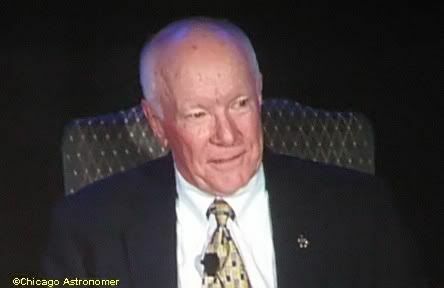 His career in the United States space program began in 1960 and has included senior positions in government and industry. At NASA, in addition to his position as Director of the Johnson Space Center, he also served as the Deputy Director of the John F. Kennedy Space Center in Florida. 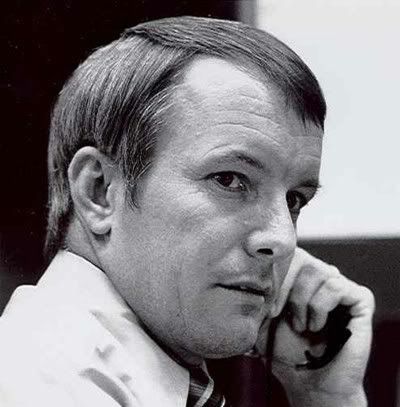 During NASA's Apollo Program, Mr. Griffin was a Flight Director in Mission Control and served in this capacity for all of the Apollo manned missions. 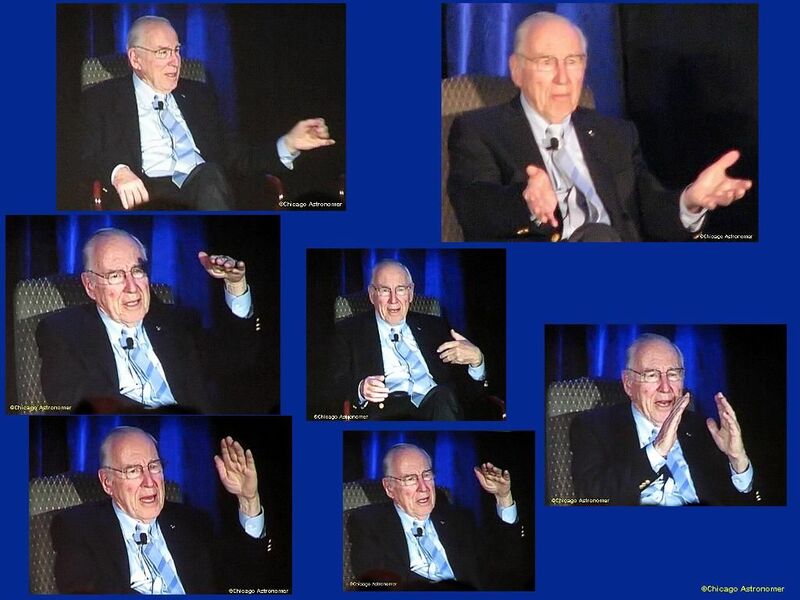 He was Lead Flight Director for three lunar landing missions: Apollo's 12, 15 and 17. 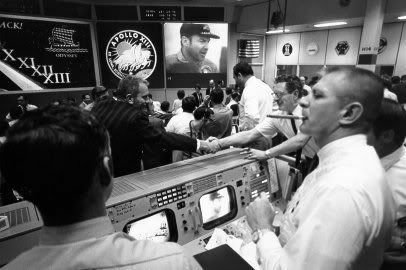 During the flight of Apollo 13, Mr. Griffin was scheduled to lead the lunar landing team in Mission Control. When the landing was canceled after the oxygen tank explosion, he led one of the teams of flight controllers who were responsible for the safe return of the astronauts. He has received the Presidential Medal of Freedom in 1970. 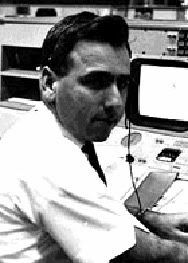 Also part of the Apollo 13 Shift Directors, not a lot is known of Windler, but he too received the Presidential Medal of Freedom in 1970. 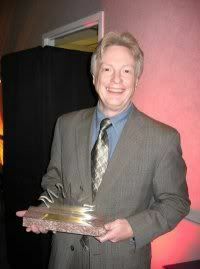 Dr. Roger D. Launius is Chief Historian for the National Aeronautics and Space Administration. 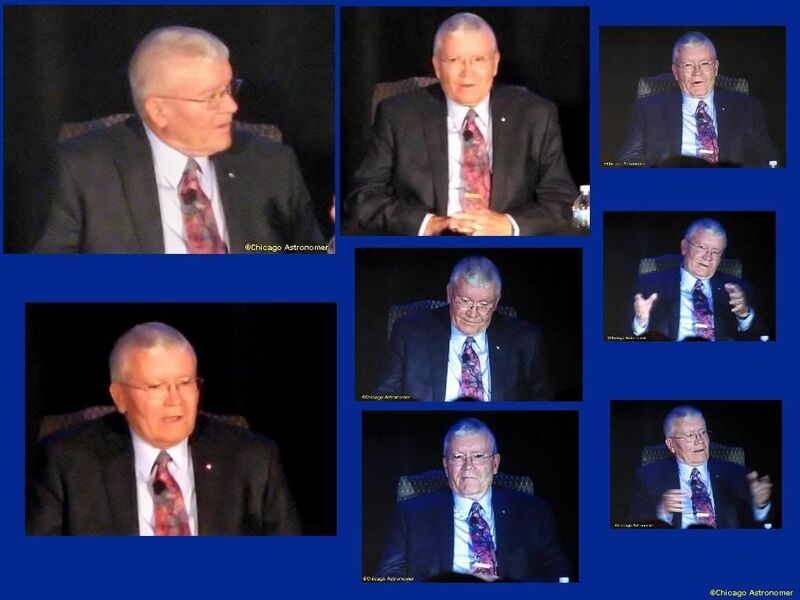 His office is responsible for preparing books, monographs, special studies, and articles on U.S. aerospace history; managing the NASA Historical Reference Collection of materials about the history of the agency; and providing historical services to both the NASA staff and the public. 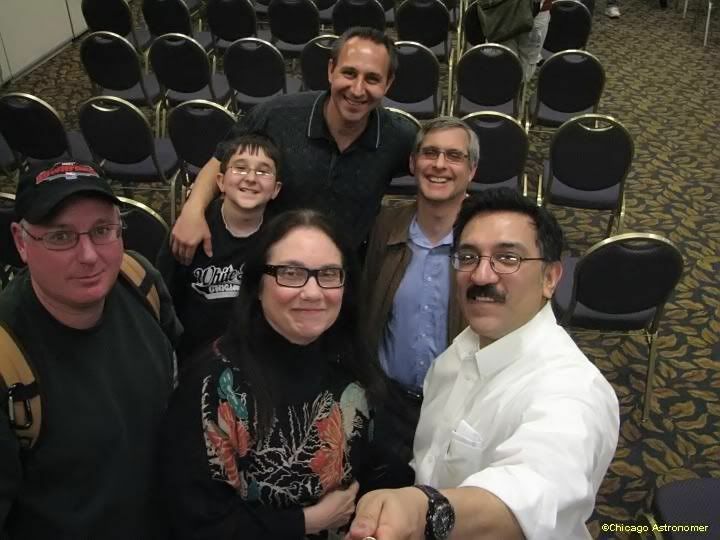 The event started at 6:30 pm and panel guests were introduced by Dr. Paul Knappenberger, President of Adler Planetarium & Astronomy Museum and handed to evening over to Dr. Launius, who would moderate the rest of the evening. 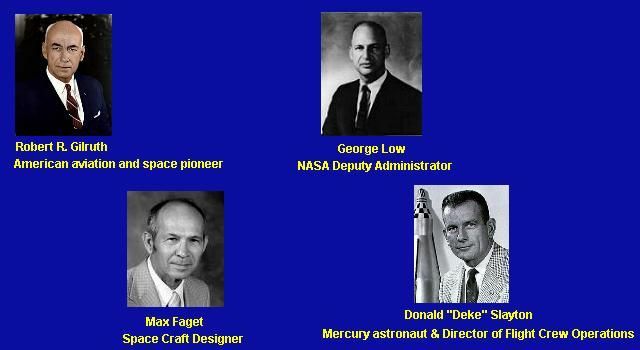 Introduced first, were the Flight directors, Windler, Griffin & Kranz. 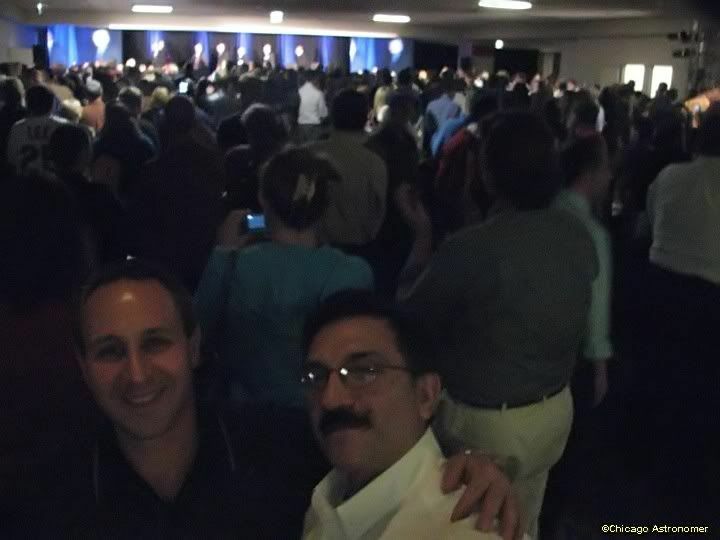 Kranz still appears as we all remember him, with his razor curt hair. With the panel set, the evening commenced. One of the questions always asked was..."How was the liftoff - what was it like?" Lovell and Haise said that unlike their fighter pilot days, the lift off was relatively uneventful. Lovell said that one hears the manifolds open up and the tons of fuel rush down ward and you know know....somethings gonna happen. Haise said that in a jet fighter, the pilot is sitting down and taking on the G's, but in an Apollo liftoff, one is laying down on your back, and although heavy with vibration, pretty easy. He also said that, it's like riding a train. As the main engines below gimble - keeping the Saturn V plumb, one feels the chairs slightly move in reaction, bumping onto each other slightly...like a train. Lovell added that when watching a liftoff from miles away...it takes a few seconds for the sound to reach the spectator...and it pounds into you, into your chest and belly. None of that in the capsule during liftoff. A question was asked to the panel...what was the first sign of trouble that sent up red flags. Kranz stated that they had redundant computer feeds, all tubes, but they were confident that if one monitoring system failed, the back up would take over....but when the accident happened, even the back ups were feeding nonsense to the flight controllers. Just utter nonsense was displayed on their screens. They just didn't know what was happening or the seriousness of the situation. Lovell called in, saying they heard and felt a big bang and had a main bus under-volt. It wasn't until Lovell announced that he saw venting from the Command Module, that Houston realized that the situation was now a serious one and the entire team shifted into survival mode. From that moment on, it took about 12 minutes to get back on track, but he didn't have all of of team, (the lunar module support crew), on hand for support and a mad rush to get everybody to their posts. 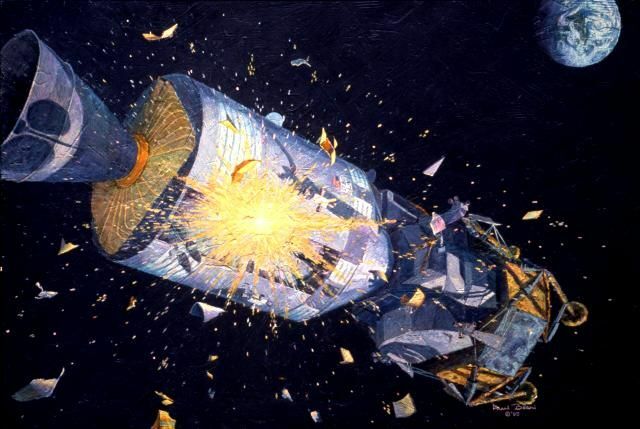 Griffin added that when this accident happened, the crew was not on the "Free Return" phase of the mission, where the spacecraft was slung by the Moon back to the Earth. It took them about 8 hours to put the crew into a Free Return, after making a burn with the L.E.M's decent engine, now acting as the main engine. He remembers that after that was done, and Apollo 13 was heading back to Earth, they all felt a bit more relaxed and even if they sent the Capsule into the Indian Ocean...at least they would be back home. Windler continues that this was 1970...and the United States did not have a presence in the Indian Ocean as it does today..and it might have been a tricky recovery. Joking, he said that "We didn't even know where the Indian Ocean was!" 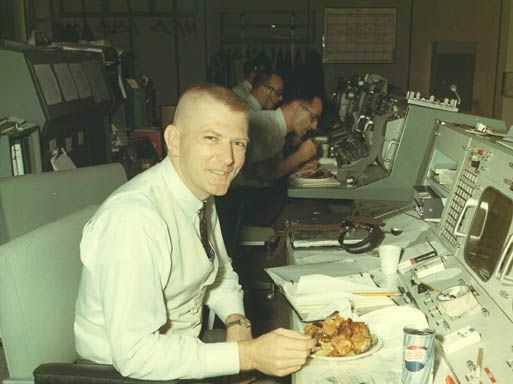 Kranz continues that they were just getting ready for a shift hand over, and it was it was fortunate, (from his standpoint), that Flight Director Glynn S. Lunney from the "Black Flight" team, sat down next to him at his console and was reading Kranz's log. As soon as the event occurred, Lunney recognized that some sort of maneuvering situation would be necessary and the mission would be have to be aborted. 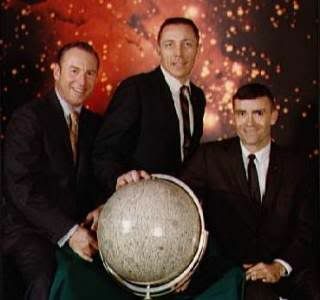 At that point, the Apollo 13 crew was at the Lagrange point - where the Earth's gravity handed the craft over to the Moon's pull. Lunney understood the mechanics of the situation, and provided, very quickly - abort options to bring them home. Three that would bring them back in front of the Moon and two that would take them past the Moon. Kranz stated that he was amazed at the precision that Lunney came up with these options when he presented them. At least now, Kranz had some game plan, but he still didn't have the lunar module guys in and Ground Control was dealing with a undermanned team... and it would take another 1/2 hour to get them all in. The majority of the ground crew thought it would be best to bring the Apollo 13 astronauts home the fastest way possible, which scared the heck out of Kranz's trajectory team, because they would use all of the propellant of the service module...if it would work at all. And if it didn't work or did partial burn, then we would have impacted the Moon. The options there "were not too swift", says Kranz. Lovell & Haise were asked if they would like to embellish on the process of coming home. Lovell adds that the plan to go around the Moon, now meant that they had to turn off practically all power to save electricity and they had to "BBQ" the spacecraft perpendicular to the Sun so it wouldn't get too hot on one side and too cold on the other. And they all were getting tired at this time and had to get some sleep, and this was something Kranz had to contend with as well. Lovell continues with his thought... "And thinking that we were on that Free Return course that would give them safe passage through the atmosphere, somebody recognized that the crew was NOT on course and about 60 to 80 miles in error....which would have the spacecraft miss the Earth and go into some sort of solar orbit...."and that didn't sound too good to us!" The crew did not have the power to turn on the guidance & navigating systems on-board, and ground control confirmed that they were no longer on a Free Return course. "Thank you" Lovell sarcastically replied. 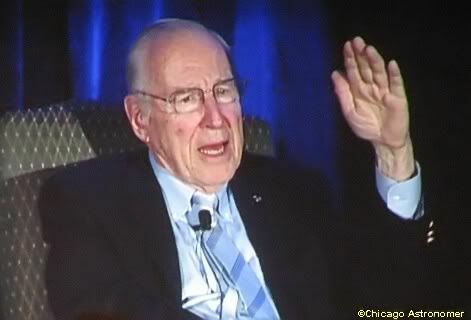 And they asked if he remembered his Apollo 8 flight? He did. They asked if he remembered the emergency flight procedures in back of the flight manual....the ones you read before the regular procedures. Lovell said that once they read them, they would usually tear them out...to save weight! "Well, you gonna have to use them now", said Ground Control. They used the Earth's terminator line to line up the gun sight/cross-hairs on the Lunar Module docking window and aligned them up to provide position for correction thruster maneuvers from the L.E.M's engine. The on-board clock wasn't running, so Jack Swigert used his watch to time the burn and was all a "seat of the pants" maneuver. Lovell was going to keep the Earth from going up & down and Haise was going to keep it from going sideways too much - with translation & maneuvering handles/thrusters. And it eased them into the proper corridor...which made everyone happy. Lovell says that he doesn't worry about crises anymore. He figures how to get out of them, uses what he has to work with and moves on. 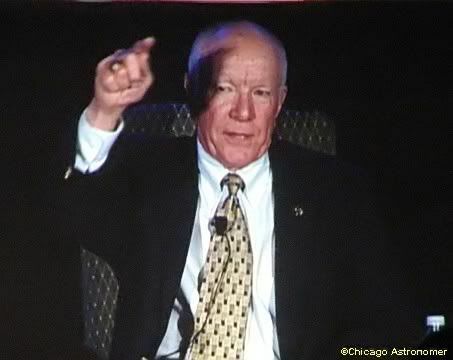 Haise says that Apollo 13 was not a religious experience, it was just a great adventure. 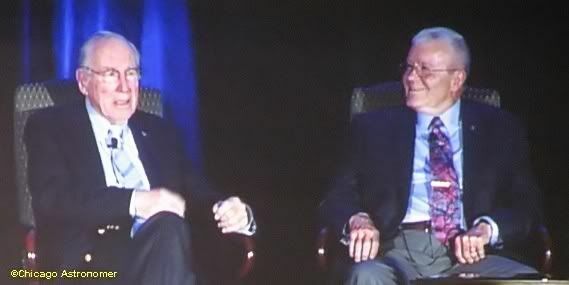 He almost immediately got reassigned and was the back up Commander on Apollo 16 and hoped to go back on Apollo 19 - which was to be the last mission to the Moon. "This was our lives" he continues, "...and just because you have this incident, (which we all have had several incidents in airplanes), we are not gonna turn away - and did not effect my life in any ways". Kranz says that it just re-enforced the processes they used in Mission Control. He says that a lot times, people come in, demanding too much of your people right down the line. One of the things he battled for in his career, was to keep his civil servants and contractors co-located together, in the same office...and you couldn't tell what type badge they wore. It was amazing at what he had to go thru to accomplish this, he says. He adds that all the missions that they flew, but particularly Apollo 11, 12, 13, 14, & 15 really said you are doing the right thing with the right people on your team...and don't give in to the political correctness, (which was starting to move in at that time he mentions), and for God's sakes, establish a set of standards and maintain that standard. "I approved basically, the characteristics of the flight controllers, and it worked." 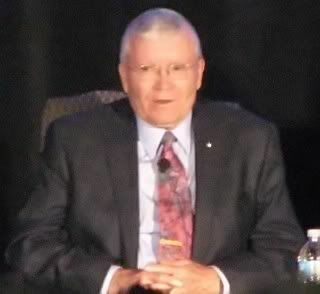 Griffin adds that he shares the Fred Haise philosophy. They were all pretty young and few airplanes. "This was fun!" he says. "Even Apollo 13 was fun!" He says that it may sound strange, but it showed hat they could do what they needed to do. What he remembers about after 13, was getting ready for 14....15, 16 & 17. But what he wanted to leave the audience with was..."This was fun - it was a hoot!". It was a chance of a lifetime to be part of Mission Control, and I'm sure it's more so in the spacecraft. And they paid us to do it! ", he ends. Gene adds..."We had spectacular leaders in NASA...at that time. You know, you think about Robert R. Gilruth, George Low, Max Faget, & Deke Slayton...these people were titans in the business of leadership! "They established a mold, and it was one of the keys that allowed us to do the things that we did. 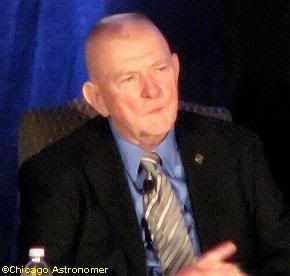 "...concluded Kranz. 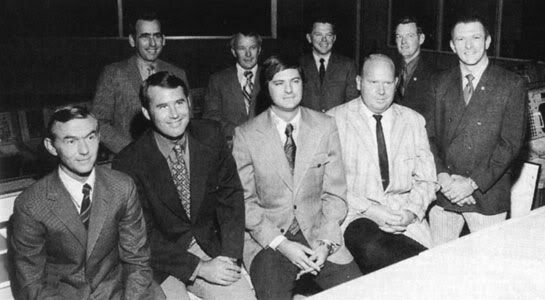 That concluded the panel of Apollo 13 astronauts and Mission Control crew. 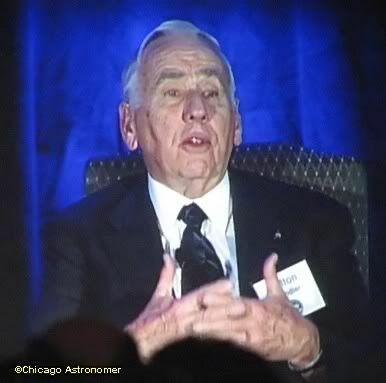 Joining me in observing this event was Chicago Astronomer John..